• Toyota projects U.S. sales of 2.4 million vehicles among 3 brands this year. • Tacoma pickup is expected to beat last year's U.S. sales of 155,041. • Toyota hasn't announced allotment plans for the Mirai fuel cell vehicle. SAN FRANCISCO -- Toyota Motor Sales expects to top 2.4 million in U.S. sales this year with several new and freshened models across its Toyota, Lexus and Scion divisions, up from just under that mark last year, executives said. Some of that extra volume will come when the redesigned 2016 Tacoma pickup reaches showrooms during the fourth quarter. "Dealers are real excited about the truck, but they need more of them," said Bob Carter, Toyota Motor Sales U.S.A.'s senior vice president of automotive operations, after the make meeting at last week's NADA convention. The outgoing Tacoma generated U.S. sales of 155,041 last year, and Toyota plans to top that in 2015, despite new competition in the segment from General Motors' entries. Toyota will add a third production shift at its Baja California, Mexico, assembly plant in April -- increasing annual Tacoma capacity there to 84,000. The truck is also made at Toyota's San Antonio plant. Dealers also anticipate a sales boost from the next-generation 2016 Prius hybrid, expected this year. "They're going to make a lot of changes to it," said Jay Caldwell, owner of Caldwell Toyota in Conway, Ark. "When they showed the picture of it on the screen, you could hear low chatter all around." Caldwell said the next Prius hybrid will feature "better styling" and improved handling and fuel economy. Toyota's fuel cell vehicle is also scheduled to arrive in showrooms in California this year, but executives didn't discuss with dealers plans to allot the Mirai. Toyota has not yet started taking orders for the hydrogen-powered sedan, but Carter said the automaker has heard from more than 16,000 hand-raisers so far. Toyota is also continuing to roll out two programs aimed at increasing customer loyalty in sales and service. Carter said the automaker will complete the national rollout of its Toyota Care Plus program in the first quarter. For $299, Toyota Care Plus extends the maintenance and roadside assistance offered free under the Toyota Care program for the first two years or 25,000 miles. The automaker is also continually expanding its express maintenance program that promises standard maintenance procedures performed in 30 minutes or less. 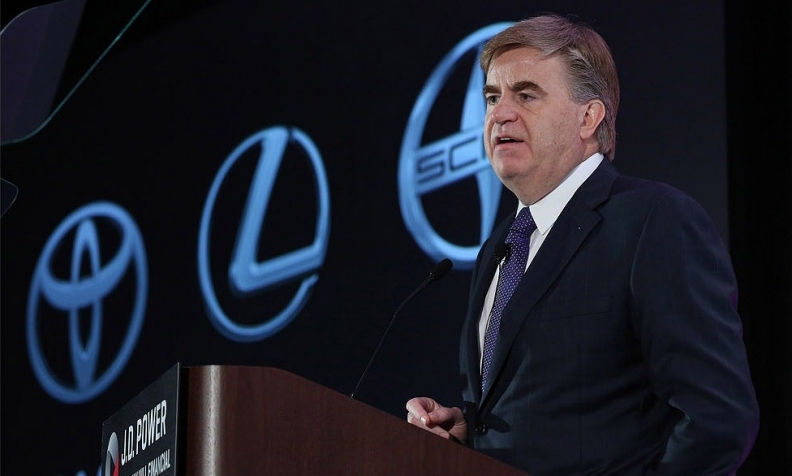 Together, those programs have increased Toyota's customer repurchase loyalty by 12 percent, Carter said. "We're trying to continually find ways to keep that going."